2DCI World Championship in Indianapolis. 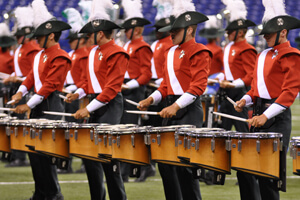 The Santa Clara Vanguard percussion section will be a featured ensemble at the Percussive Arts Society International Convention (PASIC) Saturday in Austin, Texas. Hosted by the Indianapolis-based Percussive Arts Society, PASIC is billed as the largest percussion event in the world featuring more than 120 concerts, clinics, master classes, labs, workshops, panels and presentations. Under the direction of caption supervisors Sandi and Paul Rennick, the Vanguard drum line and front ensemble will perform as part of two educational clinics during the afternoon of Saturday, Nov. 3. Sandi Rennick and the Santa Clara Vanguard Front Ensemble Performance Techniques of the Contemporary Front Ensemble Marching Clinic/Performance | Saturday, Nov. 3, 12 p.m. CT Paul Rennick and the Santa Clara Vanguard Percussion Section Marching Clinic/Performance | Saturday, Nov. 3, 4 p.m. CT "The opportunity to perform at PASIC is a prestigious honor, and we are confident our very talented group of percussionists and staff will represent SCV extremely well," the Vanguard organization published in a recent e-mail communication. Santa Clara Vanguard's participation at PASIC this Saturday won't be a first. The percussion section last performed at the annual convention in 2006. Other groups including the Glassmen (2007), Bluecoats (2007), Phantom Regiment (2008) and Cadets (2010) have also taken part in recent years. Learn more about PASIC and view a complete schedule of events.